One secret to successful soldering is to be sure your workspace is equipped with the right tools. 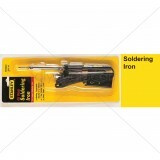 Soldering guns and pencil-style soldering irons are handy for on-the-go jobs like electronic connections and even light metalworking. For serious, precision repair and assembly, consider using a temperature controlled soldering station. It's hard to beat the convenience of dialing in the exact heat setting, whether you are soldering surface mount components, or 10 gauge speaker wire to heavy brass connectors.